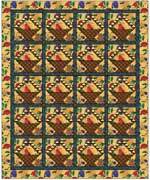 Have fun finding neat "basket" looking fabrics for the basket. 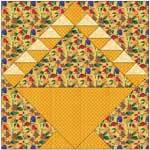 This block would look lovely with some appliqu� fruit or flowers in it. What about 3-D flowers from Kumiko Sudo's "Fabled Flowers" book? 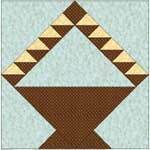 Please note, when you are cutting the basket and background above the basket you will have enough triangles of each of pieces E & F to do four blocks. You would have to cut more of the other pieces A, B, C, D, G of the block to make more than one block. A 4 1st Light Cut two 6 7/8" x 6 7/8" squares. Cut in half diagonally. B 2 Basket Cut one 4 �" x 4 �" square Cut in half diagonally once. C 10 Basket Cut three 3 �" x 3 �" squares. Cut diagonally twice. D 10 2nd Light (Handle) Cut three 3 �" x 3 �" squares. Cut in half diagonally twice. E 1 Basket Cut one 11 �" square. Cut in half diagonally twice. F 1 1st Light Cut one 11 �" square. Cut in half diagonally twice. 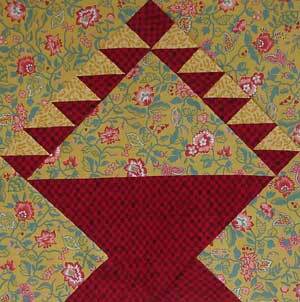 Step 1:	Sew triangles D and C together to make 10 half square triangles. Press open or toward the dark. Step 4:	Sew Section 1 to one light side of Section 3. Press seam open or toward the light. Step 5:	Sew Section 2 to the other light side of Section 3. Press seams open or toward Section 2. Step 6:	Sew two triangles A to both top edges of the basket handle area (Sections 1 and 2). Press toward triangles A. Step 8:	Sew a Section 4 to either side of bottom edge of basket. Press seams open or toward the outer edge.